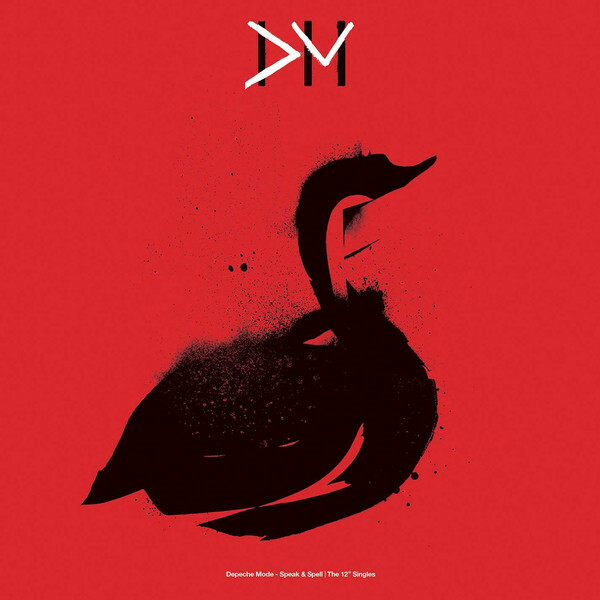 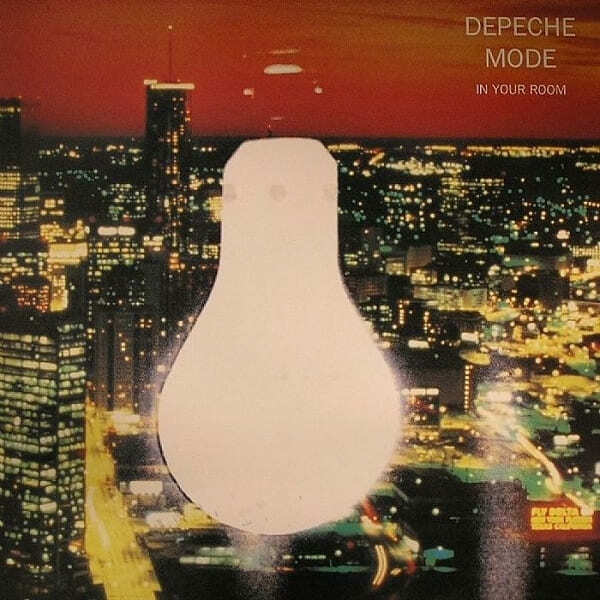 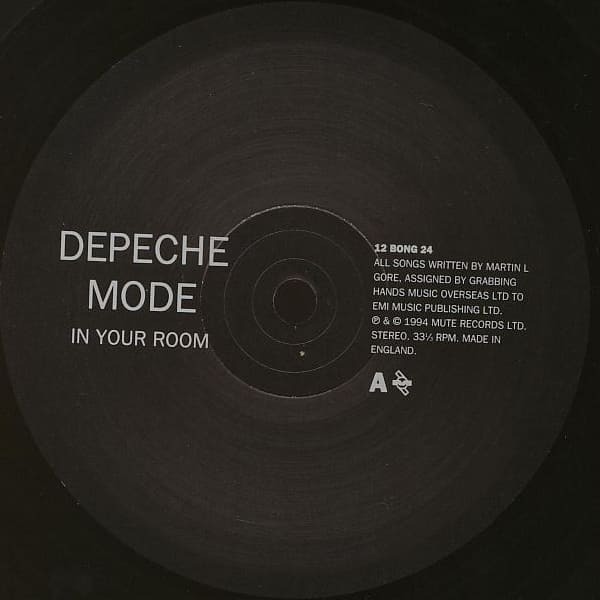 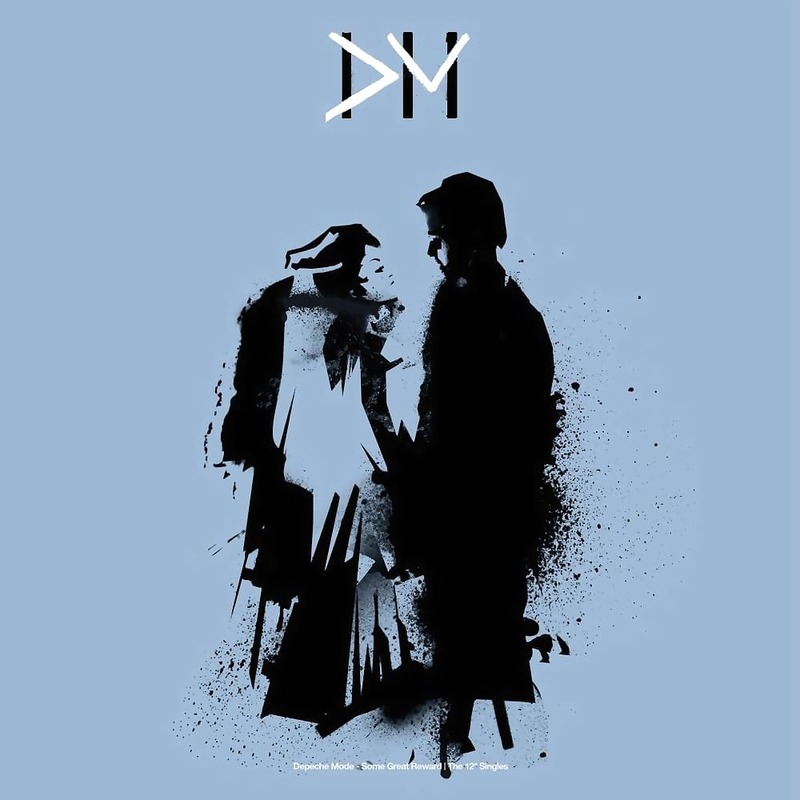 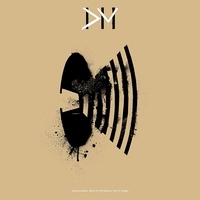 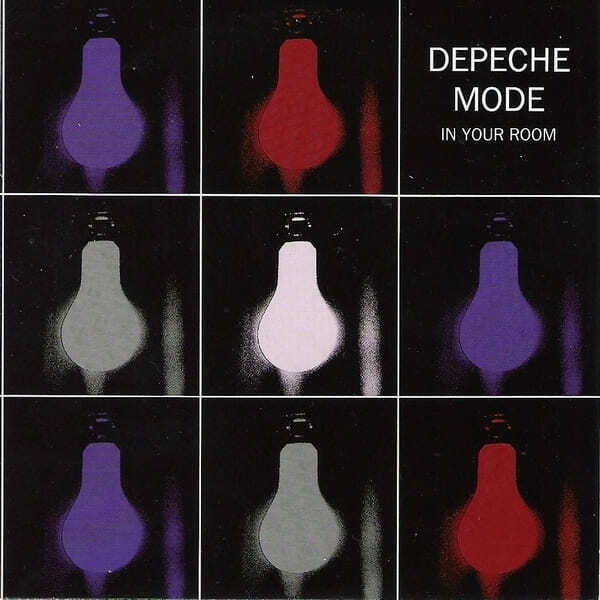 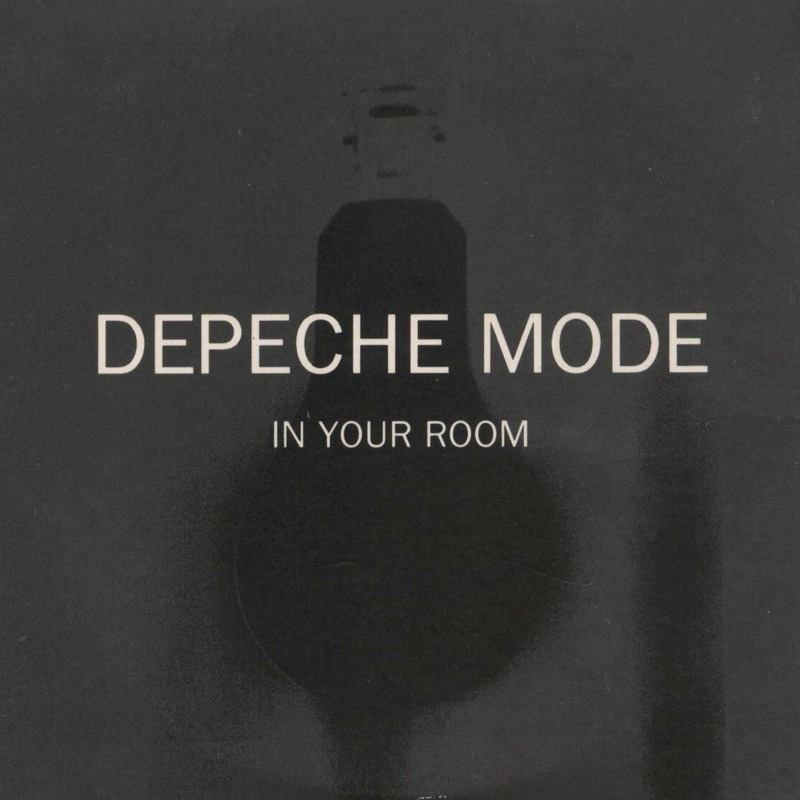 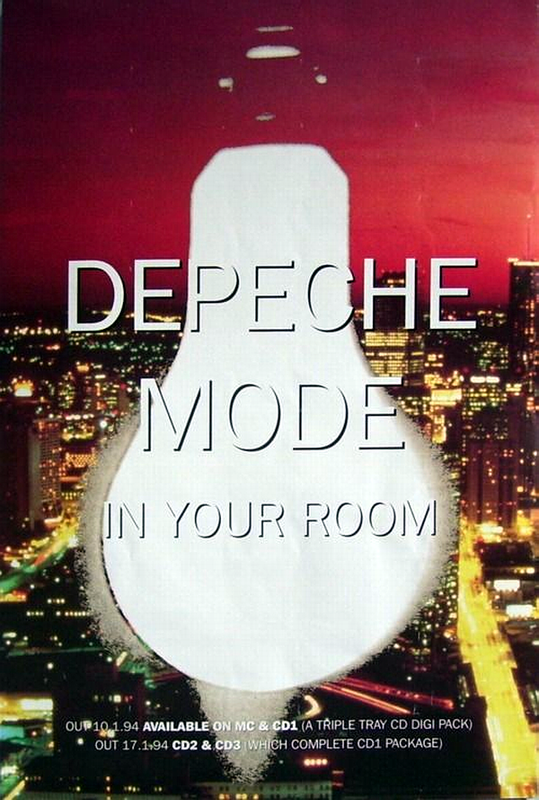 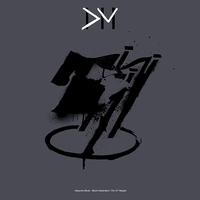 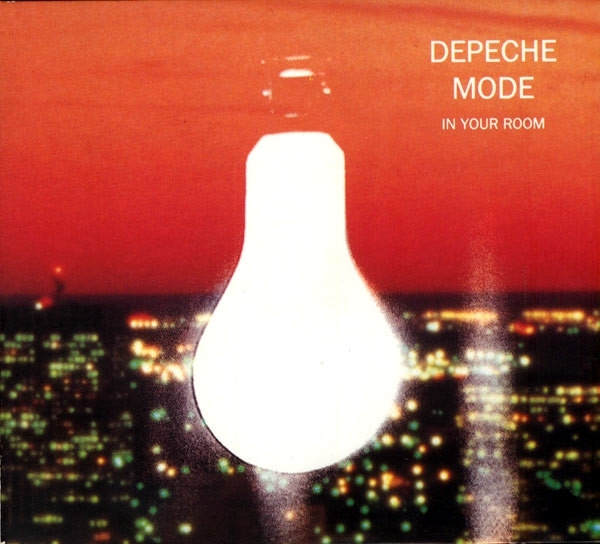 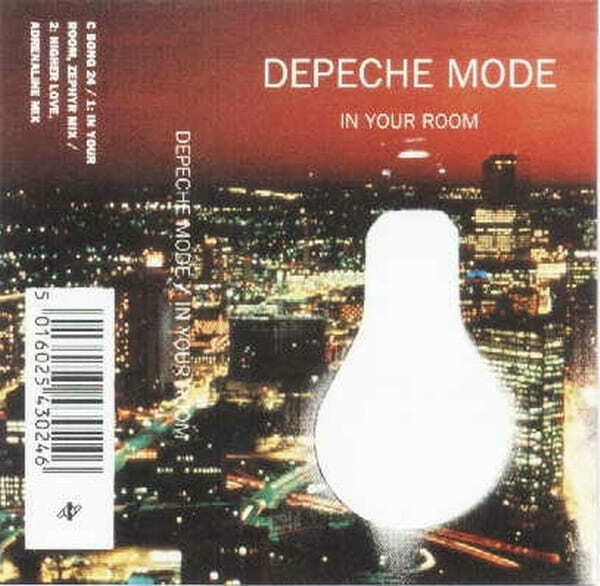 Depeche Mode "In Your Room"
The version of "In Your Room" used for the single release is the "Zephyr Mix", a radically different mix of the original album version, nearly completely redone by Butch Vig of Nirvana fame. 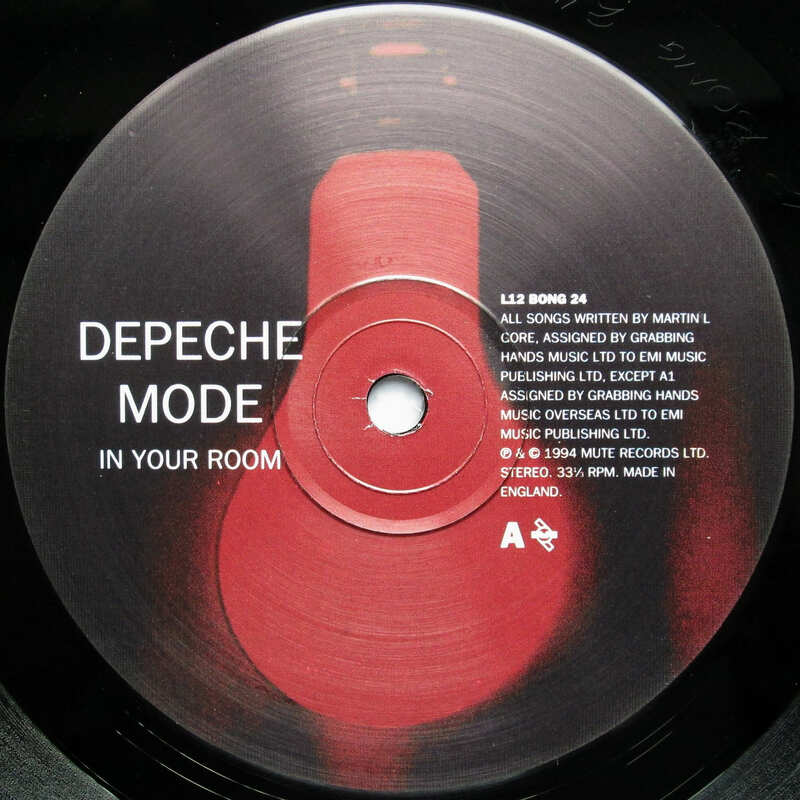 Other official single remixes include the "Apex Mix", produced by Brian Eno, which sounds closer to the album version, and Johnny Dollar's "The Jeep Rock Mix". 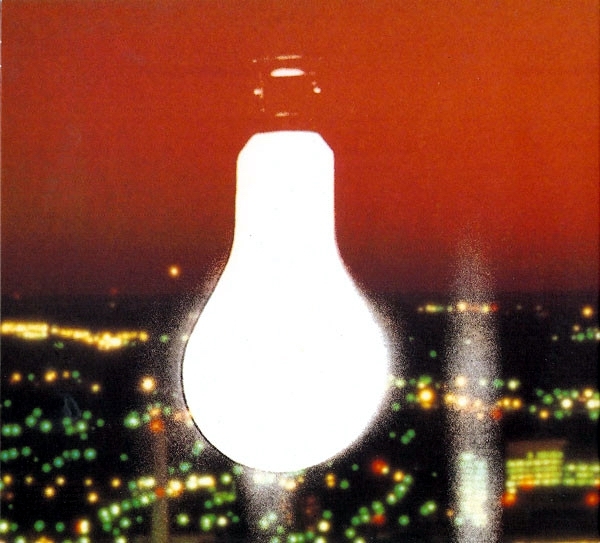 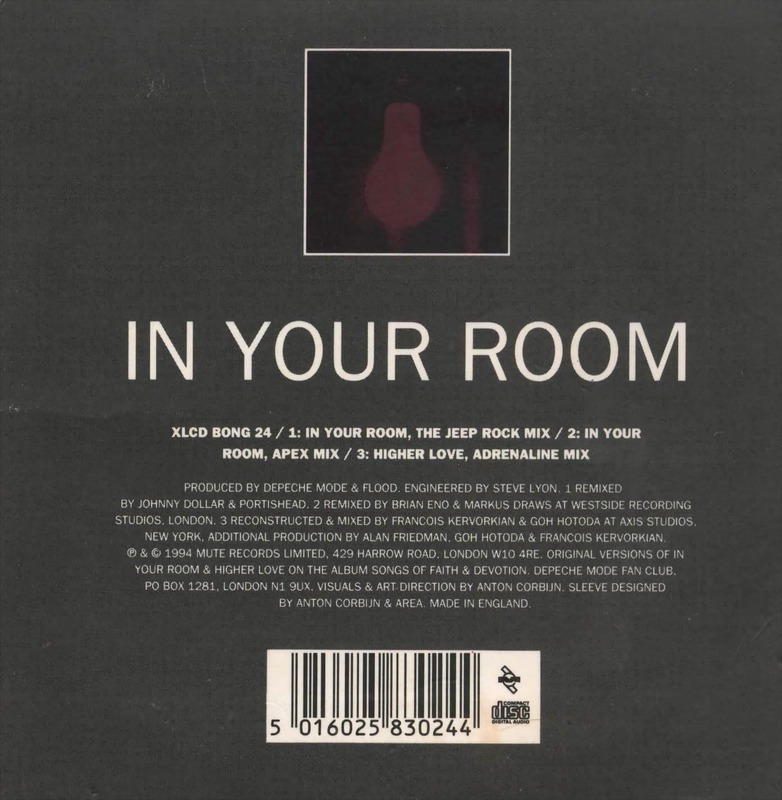 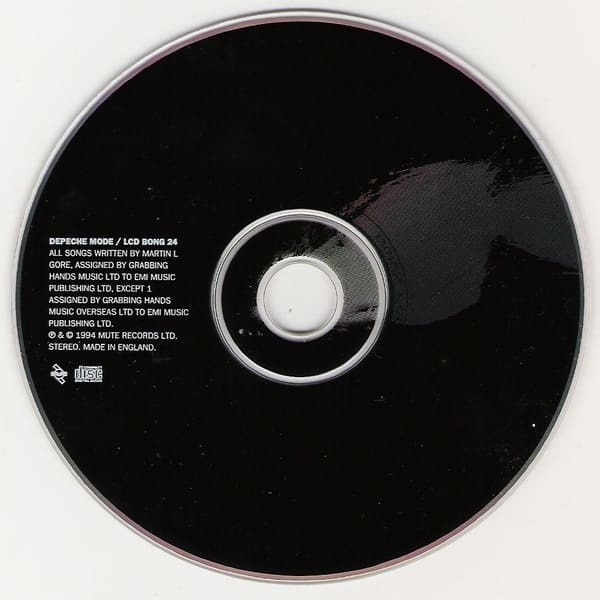 The single was released in a special foldout digipak with room to hold three different versions of the "In Your Room" single: the original release (CDBong24), a live disc (LCDBong24) and a remix disc (XLCDBong24). 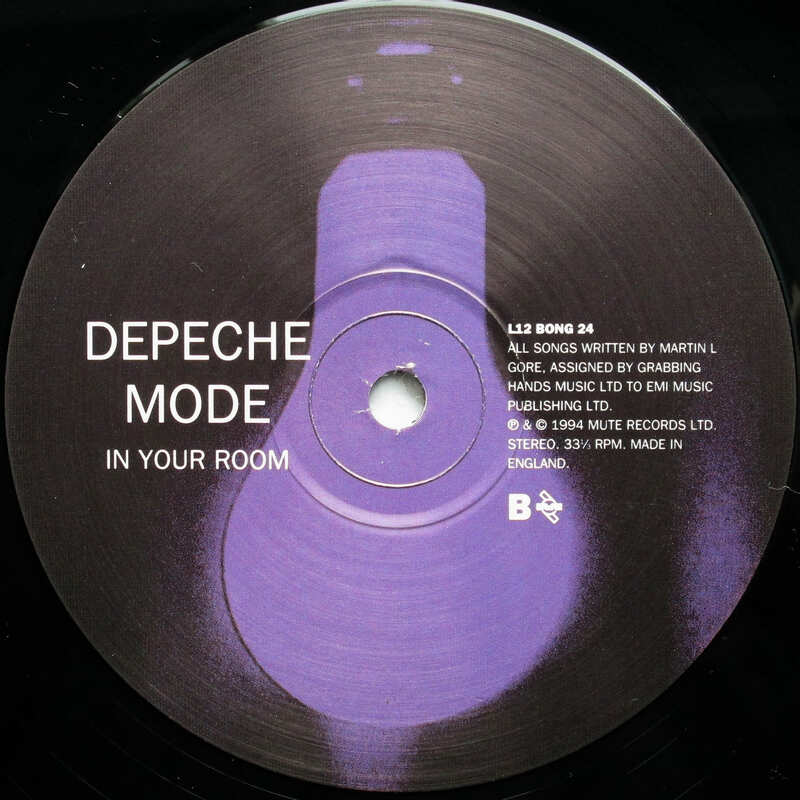 The b-sides consist of a remix of album track "Higher Love", along with some live songs from the Devotional Tour, recorded in Lieven, 1993. 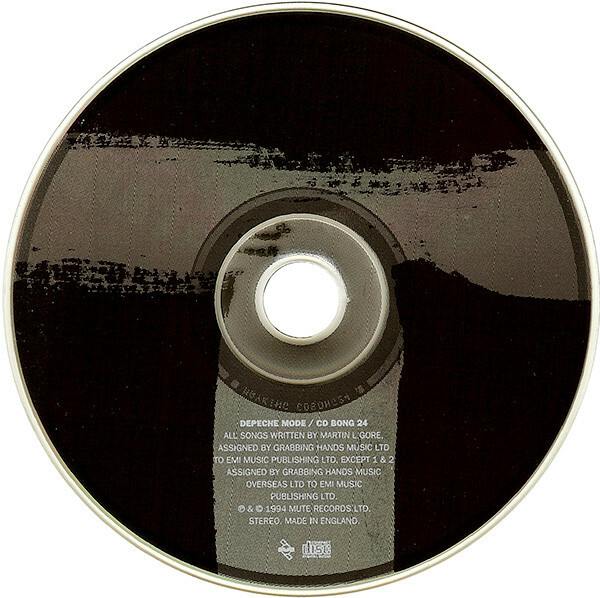 There was a US promo CD scheduled for release, but it never was. 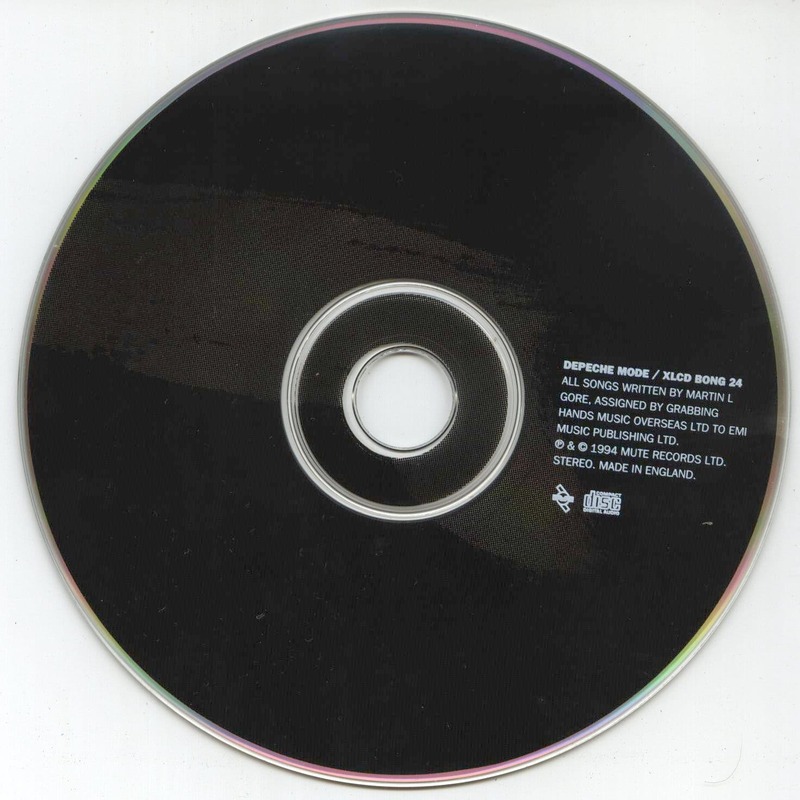 The "Zephyr Edit" version from that promo CD has never been released on any format. 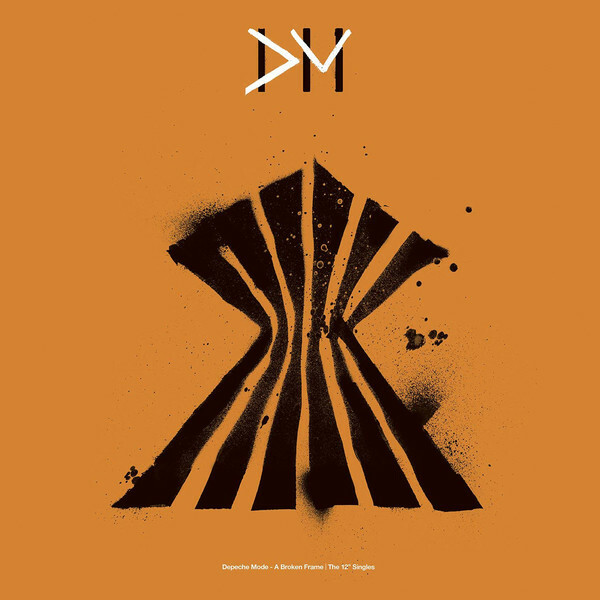 Cover: Made in England. 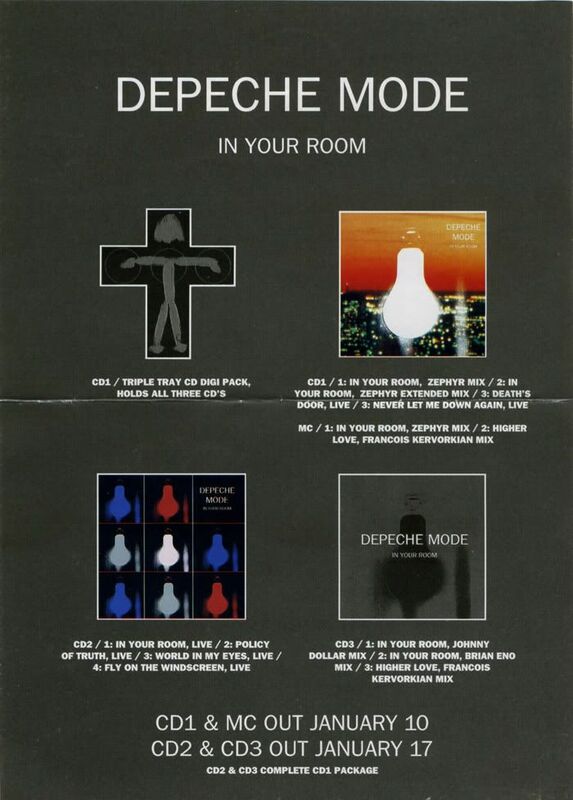 Original release comes with black luxury inner sleeve. 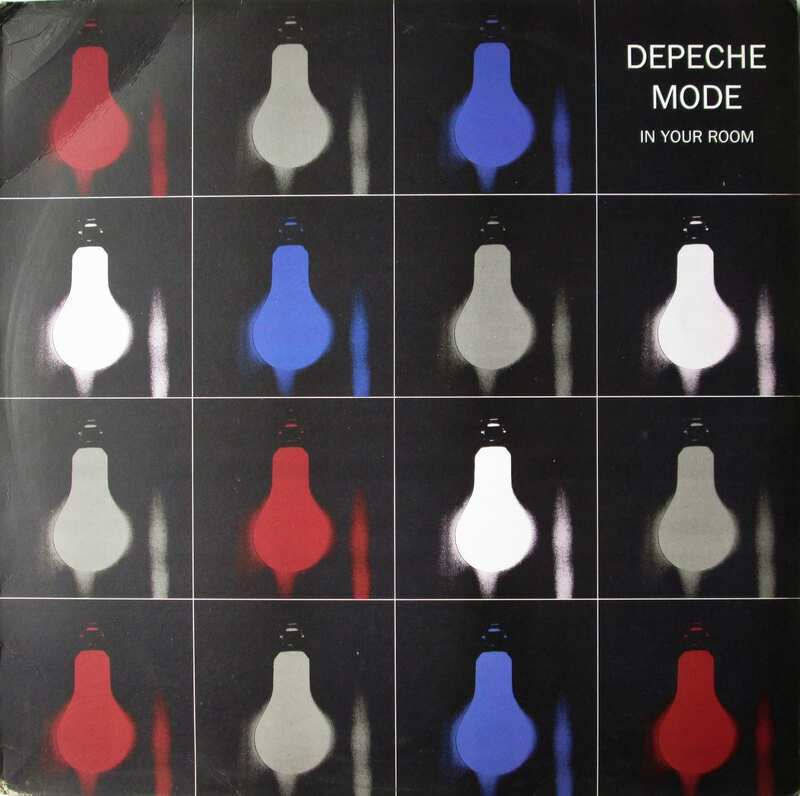 Re-pressings with white inner sleeve. 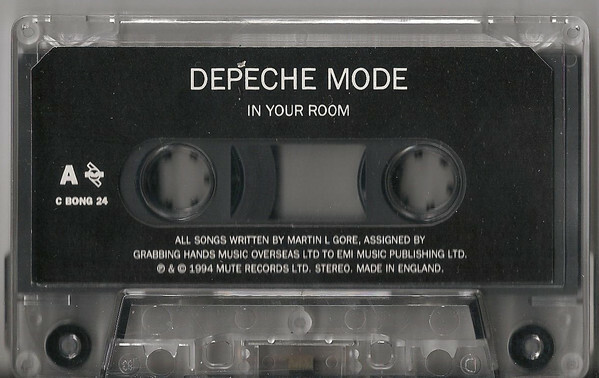 Cover: Made in England. 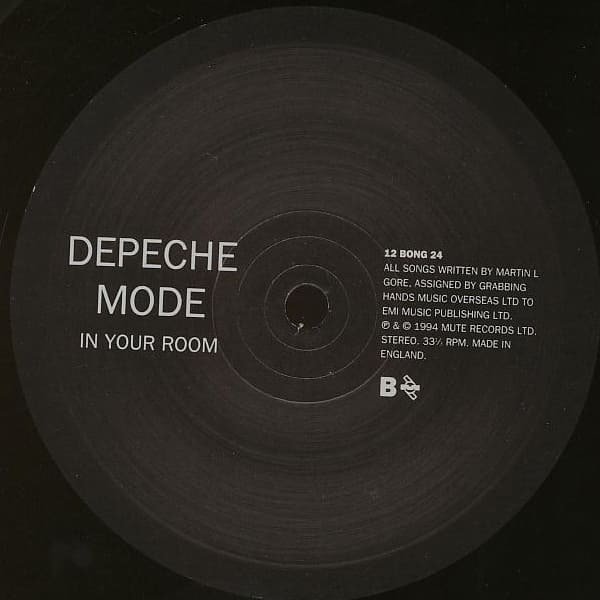 Original release with black luxury inner sleeve. 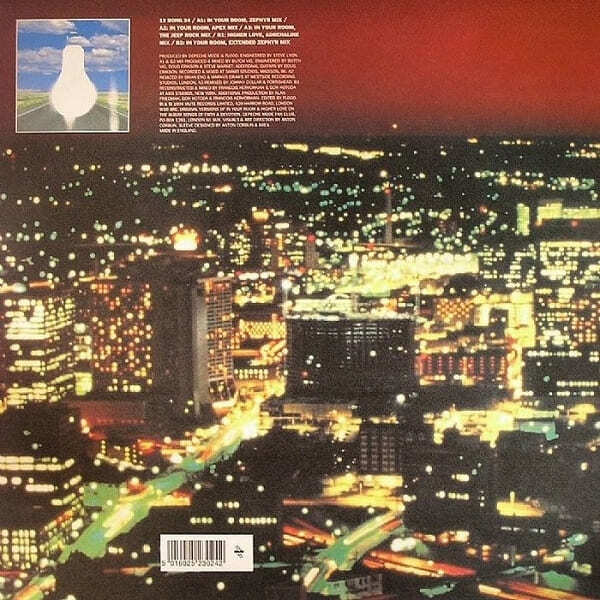 Repress with white inner sleeve. 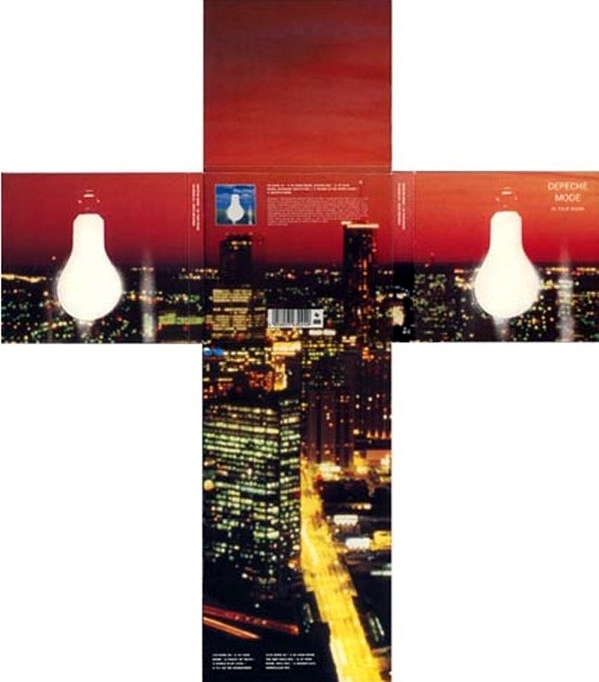 Cover: Made in England. 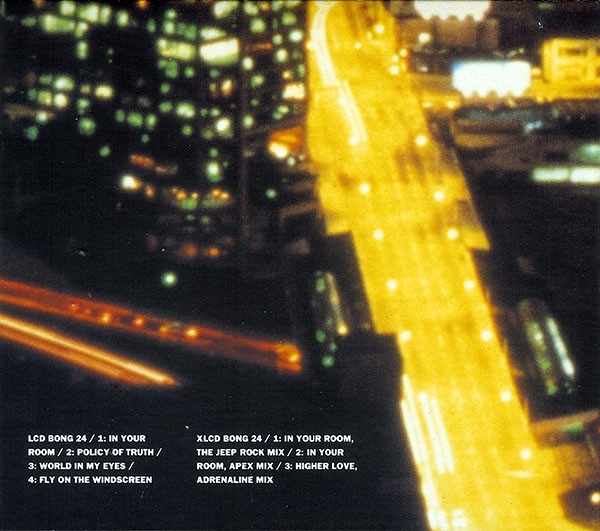 Digipak (Triple Gatefold). 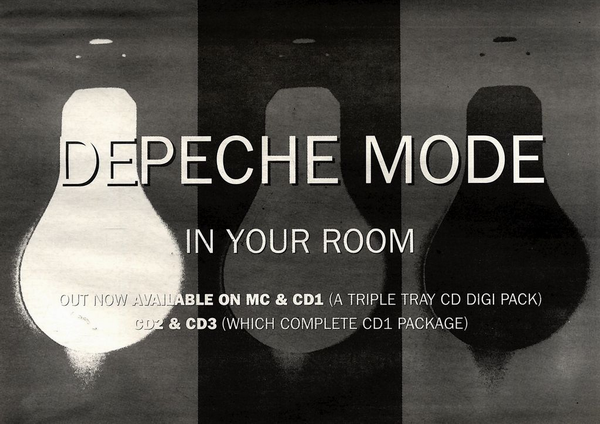 Comes in a triple gatefold Digipak case that, which come in cardboard sleeves. 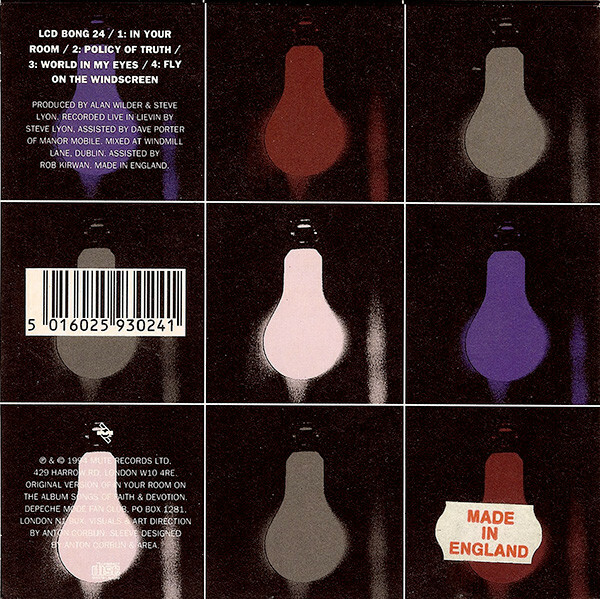 Cover: Made in England. 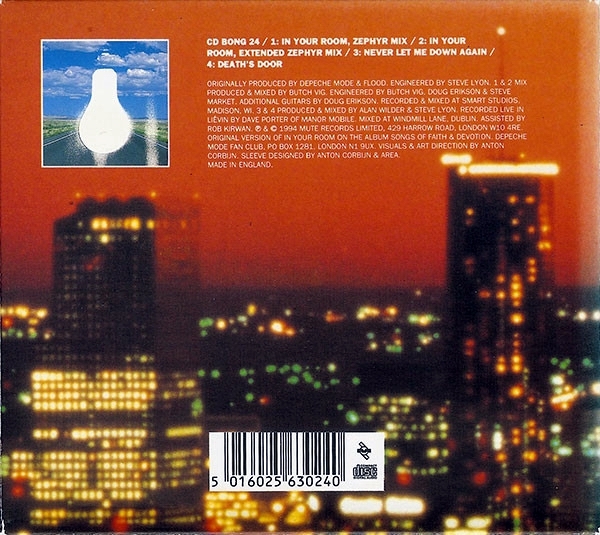 Same tracks on both sides. 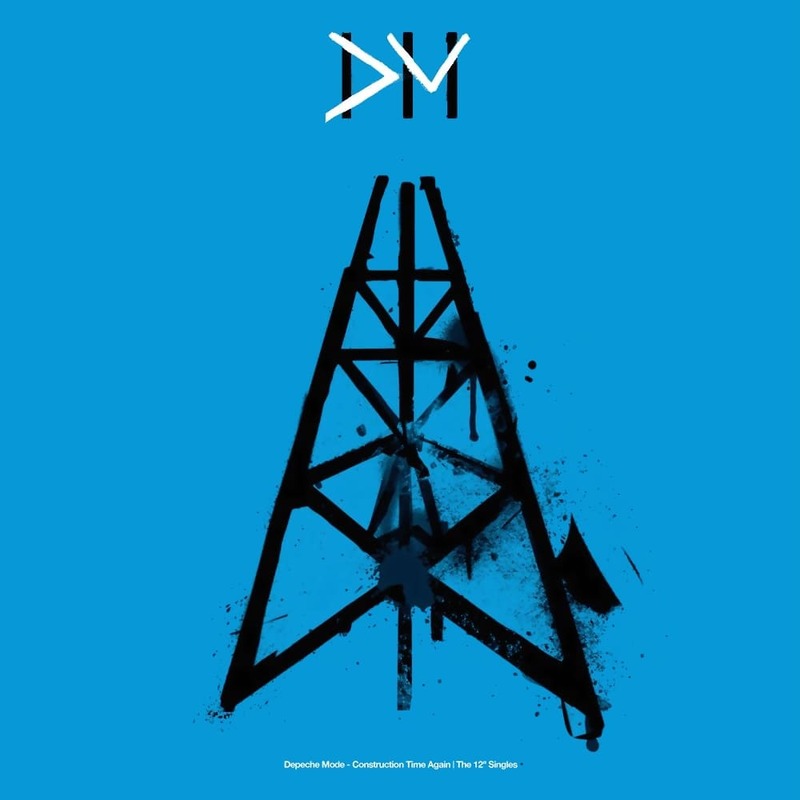 Anton Corbijn described the video as a retrospective of the work he had done with Depeche Mode. 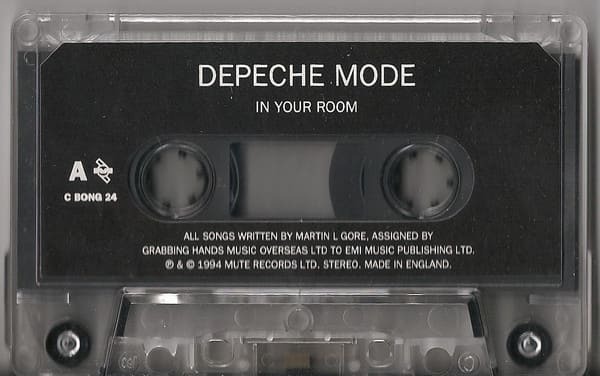 He said he made it that way because he wasn't sure if he was going to do another Depeche Mode video after it. 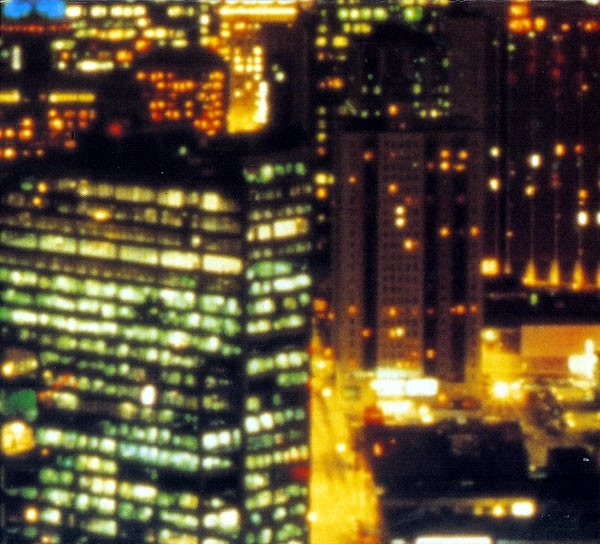 He later elaborated stating, that this video was made during the rise of band troubles so it was uncertain whether the band would still exist for another video to be made.